When David Eby isn’t teaching music to children at the Living Wisdom School in Portland, Oregon, he’s a professional cellist with the Oregon Symphony and the Portland Cello Project. 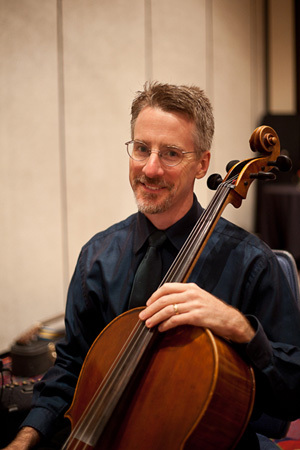 David teaches cello at Lewis and Clark College and is a Teaching Artist for the BRAVO Youth Orchestra. He also works with the El Sistema program, which brings classical music training to disadvantaged youth. 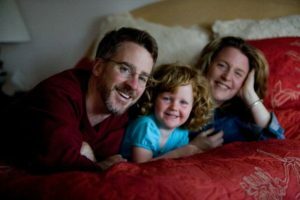 David Eby has taught in the Living Wisdom Schools for more than fourteen years – initially for two years in Portland, then twelve years at the original school at Ananda Village, near Nevada City, California, and now he’s back in Portland teaching again. Q: David, let’s have an informal conversation about the role of the arts in helping kids be happy and successful in school and in their lives. Have you given much thought to the positive role that the arts can play in a child’s development, especially during the important “Feeling Years” from age 6 to 12? Has it been a theme in your life, and in your daughter’s? David: My daughter Caitlin is in sixth grade now, and she’s performing with the Pacific Youth Choir in Portland. They recently sang Mahler’s Third Symphony with the Oregon Symphony. It was a spectacular, high-powered event – Mahler can be pretty heavy, but she was moved to tears by the beauty of it. In my life, the arts have been an absolutely constant theme. I picked up the cello when I was six, and I knew right away, with a solid intuition – “This is my instrument!” Music was something that stayed with me throughout my childhood, and playing cello and singing took me to some incredible experiences in my earlier years. It was during that time that my heart was most open, and through music I was able to experience something greater than myself, whether we call it a higher inspiration, God, or our own highest potential. The name we give it doesn’t matter, so long as we recognize the amazing things that music can do for us. There are two aspects to music. There’s the purely physical, sonic experience, and then there’s the interior, subjective response. The sonic experience is what the sound waves are doing to our brain. 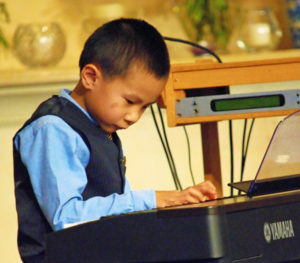 Many studies in recent years have shown that music, and especially playing an instrument, builds important connections between the two hemispheres of a child’s brain, and that when a child is having a musical experience, many areas of the brain become engaged. It’s not just a single part of the brain. Music touches a number of brain areas simultaneously, and when we’re performing, the whole brain lights up in a striking way that the scientists can observe on brain scans. The effect is also there when we listen to music, but to a lesser degree, and even when we imagine music that inspires us. It’s something that we can safely say lies beyond our intellectual perception, or the simple effect of the sound waves on the physical body and brain. There’s something that music can awaken that’s deeper than a collection of beats and sound waves and chords. Unfortunately, there’s a lot of music today, popular music, that is simply that – it’s just sounds and beats and rhythms and effects that are designed to be ear candy. It gets our energy moving and excites our emotions, but when it’s over it just dumps us back out on the curb again. What intrigues me is a kind of music that does exactly the opposite, a music that bypasses the mind and draws us inward, into a oneness with something that’s greater than the little ego and that we recognize as being the highest part of ourselves. Q: Are there levels upon levels of uplifting music – for example, music that can raise our spirits, and then music that can take us to an even higher plane? David: Yes, I’m absolutely convinced of this. I coached at a music camp last week, where an amateur quartet played a Schubert piece, and it was really lovely. Schubert wrote some incredibly inspired pieces. Some of his songs have a powerful ability to cheer us up and make us smile and feel that life is good. But I believe there are higher levels. Brahms said that he would contact a divine presence that was “superconscious” when he composed – he actually used that word – and that it was from there that he received his inspiration. For me, music is a road map, or a kind of source code that can capture inspiration, and that captures the state of consciousness that the composers were able to enter and draw upon, and bring into their music. We’re given these dots on a page, and when we perform it, there’s a big light that goes on somewhere on the scale of inspiration. And if you play the notes, and carefully tune in to the present moment, and if you’re very focused and receptive, you can get a taste or even become wholly immersed in what the composer experienced. And if the composer received it from a very high place, for example Handel’s Messiah, you can feel it touching your soul. It’s like a prescription for bringing your consciousness up onto a happier plane. It starts with the realm of pure ideas, and then it works through energy to create a sonic vibration that transmits those ideas to a deep place in us. For me, it’s one of the things in life, like nature, that can awaken a remembrance in us, of a beauty that lies within us all, and an understanding of where our truest fulfillment comes from. Our greatest fulfillments can never ultimately come from anything material. When you hear music, can you put your finger on it? Can you capture it? It’s played, and then it goes away. It’s this thing that’s completely immaterial, and yet it’s one of the greatest gifts that God has given us, because it leads us inward, toward the inner kingdom where our universal birthright of happiness lies. Q: As you were growing up, and in your career as a cellist, was there a point where you felt that there was a ceiling on the inspiration that you could tap into through the kind of music you were playing? It was totally, totally uninspiring. But, at the same time, I remember being deeply moved by the folk songs of the Seventies, especially the tunes from Godspell and others that were being sung at the time. My Dad is a Presbyterian pastor, and I grew up in those surroundings, with an awareness of the inspiration of Spirit. I thought, “I’ll end up playing in an orchestra surrounded by miserable musicians, of whom there a great many, and cynical, jaded, uninspired conductors, and an audience that’s dwindling, and music that for the most part isn’t inspiring at all. There’s a lot of music that is inspired, but orchestras oftentimes have to program “new music” to win the grants that will support the more inspiring stuff. And it’s very unfortunate that in contemporary music we have a great deal to learn about inspiration. Right now, it’s seems that the more outrageous and atonal and banging and confused it is, the better the music is purported to be. There’s a lot of powerful music – but uplifting? – hm, I don’t think so. So I put my career on hold when I was in my late twenties, and I went off in search of that lost inspiration. And, interestingly enough, I ended up actually finding it. At first I was looking for a way to serve society through music, which I felt would be a heart-opening and fulfilling thing to do. My first attempt was when I joined a troupe of storytelling musicians who were addressing the needs of children in the Feeling Years that we’ve been talking about, from age 6 to 12. We would take stories and set them to music, and we would become the characters and act out the stories, like the Pied Piper of Hamlin. I remember dressing up like the mayor of Hamlin – I would strap my cello to my body, and we would play and sing and enact the story. And for a long time I felt very inspired, because it really was serving the needs of young children who desperately need upliftment through the arts. But then over time it turned out to be too much of an “art for art’s sake” kind of thing, with a precious kind of self-conscious flavor that sapped the feeling of expansion. So I bowed out and began working with the Suzuki Method, which is founded on a beautiful philosophy of creating children who won’t necessarily be professional musicians, but who will be human beings with beautiful hearts. And that was just an incredible experience, because there was a lot of wonderful material there. But then I noticed that whenever I would go to a Suzuki conference, I would be surrounded by people who were ordinary music teachers who’d seized the opportunity to slap a button on their chest that said, “Hi, I’m a Suzuki teacher.” They weren’t looking for something that would be more deeply meaningful, in the way that I was. Then, thank goodness, I found Ananda, and I started working as a teacher at the Living Wisdom School in Portland. At that point, I had quit professional music, and I just dove headfirst into teaching, with these kids who were all in the age group of 6 to 12, and it was the hardest job I’ve ever had, because of the tremendous energy I had to put out to manage the kids and connect with them. I had a class of all girls and one very shy boy who was overwhelmed and wasn’t able to put out much energy. So, for the first two years, it was just the typical, terribly difficult, soul-searing experience of being a beginning teacher. Then we moved to Ananda Village, where I taught music in the Living Wisdom School for twelve years, and it was an incredibly fulfilling experience, and very, very successful. Q: Here in Palo Alto, Helen and Gary often have to explain to parents why we spend so much time on the arts. The parents wonder if we might be neglecting the kids’ academic studies. It can be difficult to persuade them that forty years of experience have shown us that engaging kids in the performing arts has a very positive effect on their academic performance. There’s a strong component of feeling in the learning experience, and it needs to be cultivated, as an important cornerstone of the academic curriculum. One of our students is a gifted young classical pianist. Arthur just finished third grade, and you can see that he’s totally focused and engaged when he plays, and it’s a quality that carries over to his studies, and his interactions with the other children. In your years of teaching, have you noticed that the children’s lives are meaningfully enhanced as a result of the time they spend in the arts? David: Without the slightest question. One of my first students in the Portland school was Keshava Betts, who’s now in his late twenties and lives in Los Angeles, where he plays cello very inspiringly. Keshava realized very early on that if he was feeling low, all he had to do was pick up the cello and play, and he would very quickly feel better. 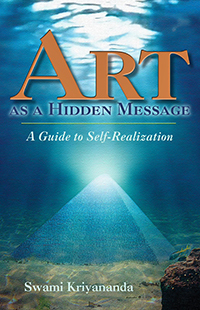 That’s a huge gift – to have the tools to raise our consciousness. It’s one of the most valuable skills we can learn. Swami Kriyananda talked about this force in music. He said that music, like architecture, can hold a vibration, and a state of consciousness. And when we walk into an inspired piece of music, it’s like walking into a beautiful building, and it can change our consciousness. We walk into a holy place and we feel uplifted, and we walk into a holy song, and the same thing can happen. For me, it’s an awe-inspiring responsibility to provide uplifting music for children. I’m teaching music at the school in Portland now, and for the children to walk into these pieces, it changes them. It’s very important to provide opportunities for them to explore those higher places in themselves. You can’t force it. It’s not something that you can ever hope to drive into them – “Now I want you to feel!” (laughs) And it’s the same with adults. There are adults who love the music, but they have a hard time tuning in to the inner experience of it. And it’s a joy to help them find that happiness in themselves. I’m working with a music education program called El Sistema, which was started in Venezuela in 1975 by an educator, musician, and activist, José Antonio Abreu. It brought intense classical music training into the slums, the barrios, and it transformed the whole society, to the point where eighty percent of the doctors and lawyers and educators came up through this system as children. That’s an amazing, powerful statistic! We’re working with children in an impoverished area of north Portland. It’s hard to measure the changes in just the last three years, because how can you compare where a child is now, compared to some other potential for the child? But we’ve seen an incredibly positive development of personal skills and confidence and social maturity. Q: These inner changes are starting to be documented by science. It’s been shown, for example, that in the presence of expansive feelings like love, compassion, kindness, and so on, the heart’s rhythms change from relatively chaotic to extremely harmonious. The scientists who’ve studied these changes have shown that those harmonious vibrations have a powerful effect on the body and brain. They’ve found that in school districts where they’ve taught their heart-harmonizing methods to children, including methods that employ music, the children’s grades uniformly improve. David: A wonderful thing about music therapy is that it brings the children into an uplifted, happy place in their consciousness, without your having to nag them into changing. There doesn’t have to be a teacher or parent yelling at them, “Change your energy!” And the kid is going, “I don’t know how.” But if you have them perform uplifting music, it puts them in the right cycle automatically, and it does it effortlessly. It’s been really fun for me, over the years, to have the children perform only Swami Kriyananda’s music for a time. I was amazed how the kids never tired of it. And if they want to learn some new songs, we were fortunate to have over four hundred pieces to choose from. Through music, children are able to tap into a higher awareness that’s always with them, without having to struggle to quiet the mind, or to get past the intellect. We would do these positive, uplifting songs, and they loved them – like “Mañana, Friends,” or “A New Tomorrow” or “If You’re Seeking Freedom.” And it was amazing how it would change their mood.